Statistics Korea has released the nation's first-ever economic census. Not surprisingly, it shows that in 2010 the manufacturing sector continued to dominate South Korea's economy. According to the report, the total yearly revenue of Korean businesses reached 4,332 trillion won ($3.8 trillion) in 2010. 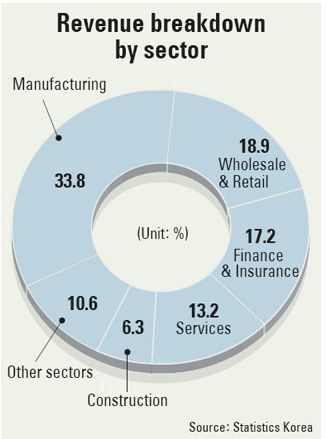 The breakdown of that total among major sectors is show in the accompanying graphic (click on it to see a full-size version). Note that the services sector, includes dining and lodging, broadcasting and media, education and health and social services. As illustrated in a post I did over a year ago, the heavy dependence on manufacturing represents a long term trend. Korea's dependence on manufacturing and the export of manufactured products seems to permeate its ICT sector. Over the past week or so, Samsung Electronics has received a great deal of publicity owing to the dramatic increase of its exports in the first quarter of 2012, spurred by high global demand for its smartphones and other mobile handsets. Industry observers have also noted the success of Samsung, along with LG, in the global market for television sets and displays, now that the thinner, lightweight and lower power consumption LED technology is going mainstream. Despite South Korea's remarkable success in manufacturing and the global export of its manufactured products, there seems to be a general understanding that, to ensure future success, the nation must improve the relative strength of its service sector. The reason for this is the relative size, in the global market place of services, software and content, compared with communications hardware. 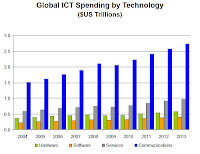 It is difficult to convey just how large the global ICT sector is, but the accompanying bar chart from the Digital Planet 2010 report of the World Information Technology and Services Alliance provides one industry estimate. (click on the chart to see a larger version) To interpret this chart, keep in mind that communications spending, represented by the blue bars, includes the total value of voice and data communications services and equipment. The equipment category, of course, includes both wire line and wireless handsets, switching equipment, answering machines and so forth. 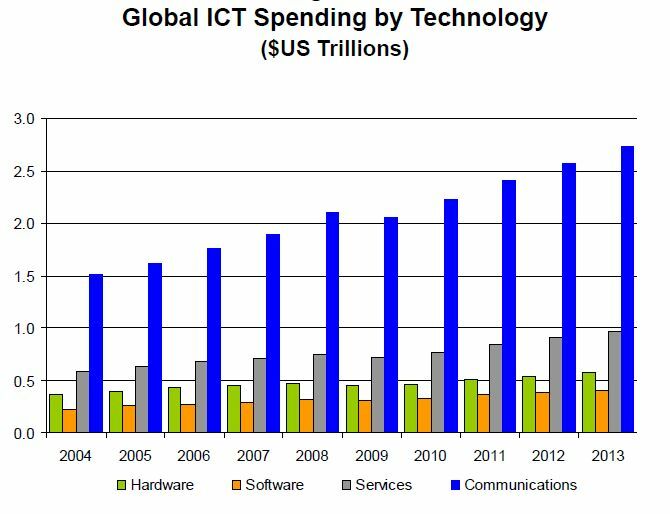 Nevertheless, it seems clear from this bar chart that the total value of software and services far exceeds that of hardware and equipment.